Perform some action on a Panel (e.g. setting focus to the next or previous Panel, or to a particular named panel). Used with the UX component. The options with the 'History' prefix allow you to navigate through the Panel Navigator's history (much list the way a browser's history button works). Specify the Panel Action that you want to execute. Choices include. Specify the Panel Navigator in which the target Panel exists. Specify the direction in which you want to navigate. 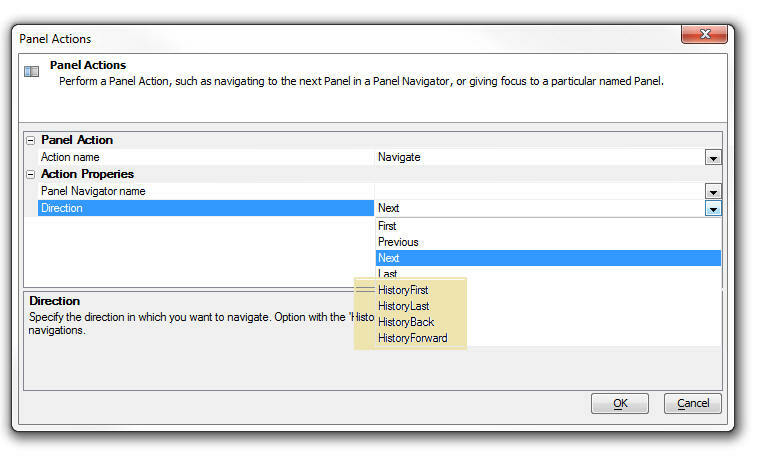 Option with the 'History' prefix navigate within the context of the Navigator's history of prior navigations. Choices include First, Previous, Next, Last, HistoryFirst, HistoryLast, HistoryBack, HistoryForward. Specify the name (Id) of the Panel that you want to set focus to. Specify the name (Id) of the Panel that you want to scroll. Specify if the Panel should be animated as it comes into view. Specify the name of the panel for which you want to get the Id of. You can specify which part of the Panel you want the Id for (e.g. Body, Header, Footer). Specify the Panel part that you want the Id of. You can use this id to set the InnerHTML property of the Panel part (does not apply if part is 'Panel'). Choices include Header, Body, Footer, Panel. Specify the name of the IFrame Panel Card that you want to set the URL for. (Optional) Specify the Panel Navigator or Panel Layout for which you want to get the active Panel. If you leave this blank, the top level Panel is returned. (Optional) Specify the Panel Layout for which you want to get the active Docked Panel. Specify the action. NOTE: If you have not added a header or footer to the Panel in the UX design, the 'show' action is meaningless. Choices include Show, Hide. Specify the name of the panel for which you want to get the size. You can specify which part of the Panel you want the size for (e.g. Body, Header, Footer). Specify the Panel part that you want the Id of. You can use this id to set the InnerHTML property of the Panel part. Choices include Header, Body, Footer. Specify the scroll position in pixels.